Wall Street plunged and Treasurys jumped Wednesday after the dollar sank further and credit concerns continued to weigh on investors. The Dow Jones industrial average fell more than 300 points. The dollar swooned amid speculation that China will seek to diversify some of its foreign currency stockpiles beyond the greenback. Meanwhile, a record loss from General Motors Corp. owing to an accounting adjustment further dragged on the Dow industrials. Meanwhile, Oil prices stalled in their climb toward $100 a barrel Wednesday after a government report said oil inventories fell less than expected last week while refinery utilization remained flat. Oil investors largely viewed the report as neutral in that it confirmed a view that oil supplies are falling, but offered no real surprises. A larger than expected drop would most certainly have propelled oil past $100 a barrel for the first time. Crude inventories did fall at the closely-watched New York Mercantile Exchange delivery terminal in Cushing, Okla., but that did not appear to be enough to propel prices sharply higher. "We got kind of a mixed reaction," said Phil Flynn, an analyst at Alaron Trading Corp. in Chicago. At the pump, meanwhile, the national average price of a gallon of gas rose 1.9 cents overnight to $3.043, according to AAA and the Oil Price Information Service. Prices are up nearly 29 cents since mid-October and are 85 cents higher than a year ago. "I don't think it's a question of whether we hit $100. It's a question of how much time we might spend there," Tom Kloza of the Oil Price Information Service told CBS' The Early Show. The 13-nation euro hit a fresh record against the dollar, rising to $1.4729, before falling back. The dollar fell not only against the euro but in Asia following a report that a senior Chinese political figure said China should diversify its $1.43 trillion foreign exchange reserves into the euro and other strong currencies. The euro's rally put it well above the $1.4554 the currency bought late Tuesday in New York. The previous record high, also set Tuesday, was $1.4571. Financial stocks, battered in recent sessions by big write-downs by names like Citigroup Inc., fell again Wednesday amid fresh concerns about the extent to which bad debt tied to a faltering housing market will hurt balance sheets. 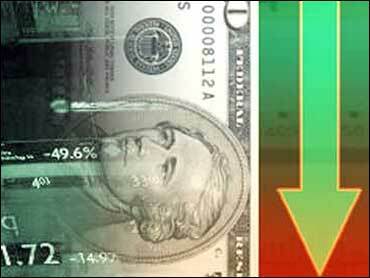 In late afternoon trading, the Dow fell 310.03, or 2.27 percent, to 13,350.91. On Tuesday, the Dow gained about 117 points as some investors looked for bargains despite overhanging concerns about the banking industry's exposure to bad debt. Broader stock indicators also pulled back Wednesday. The Standard & Poor's 500 index fell 37.55, or 2.47 percent, to 1,482.72, moving below the psychological benchmark of 1,500. The Nasdaq composite index fell 62.97, or 2.23 percent, to 2,762.21.